This Bighorn Ram Trophy Skull Wall Hanging Sculpture is 11.25" tall, 11.25" wide and 4.5" deep overall approximately. 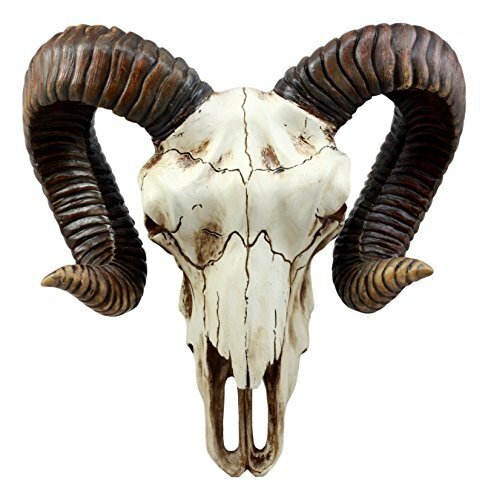 This Bighorn Ram Trophy Skull Wall Hanging Sculpture is made of designer composite resin, hand painted and polished. Color Tone may vary. Looking for an exotic wall decor to add flavor to your room? Look no further with this high quality wall plaque!!! It is not a real ram skull so no ram was hurt during its production! This Skull hangs on one screw on the wall. It is highly recommended to anchor drywall before hanging the wall decor.